This 14-7 win at Minnesota officially occurred Saturday, but it was a result of what happened Monday through Wednesday. 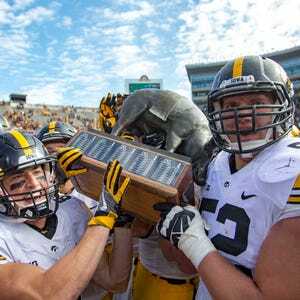 MINNEAPOLIS — As Mitch Leidner’s fourth-down pass to the end zone fell incomplete, the announced crowd of 49,145 at TCF Bank Stadium saw Iowa secure a crucial Big Ten Conference win Saturday. But, in actuality, this 14-7 victory over Minnesota happened with zero fans watching — Monday through Wednesday in Iowa City. “A couple guys really gave us a lot of juice during practice,” linebacker Josey Jewell explained. One of the fire starters, Jewell divulged, was one of the most embattled guys during Iowa's 38-31 loss to Northwestern a week earlier: Junior strong safety Miles Taylor. Taylor didn’t play well vs. the Wildcats, at times tackling air and arriving late in pass coverage. But he arrived at practice two days later with a renewed urgency and attitude that this teetering team desperately needed. Fellow safety Brandon Snyder described Taylor’s "hatred of losing," and that the junior delivered “absolutely uncommon enthusiasm" in practice. The other guy that brought “juice” to the practice field may come as a surprise. It was backup linebacker Aaron Mends. Mends registered no official stats Saturday, but give the sophomore a midweek assist. The linebacker cites responsibility, energy. Leadership and chemistry is very difficult to grasp on the inside, and especially on the outside. But when you hear about what Taylor and Mends were doing in practice — and how it bled to other players — it feels like the type of thing that can shape a new mentality. And maybe change a season. A defense that had been a sieve against the run (182.8 yards a game) stuffed Minnesota for just 102 yards on the ground. That’s the lowest rushing total for an Iowa opponent since the seventh game of last season, when Northwestern ran for 51 yards. “I wish I could give you a one-word or one-sentence answer,” head coach Kirk Ferentz said. There are much tougher games ahead. But if Iowa's run defense is as ball-hawking as it was Saturday — the Gophers’ longest rush on 29 attempts was 11 yards — this season has a chance to special. Not many Hawkeye fans felt that way the previous seven days, not after watching what the league’s lowest-scoring offense, Northwestern, did to Iowa in Kinnick Stadium. But Minnesota, a team that was averaging 36.2 points a game, was held to a single touchdown Saturday. And it's because Iowa first stacked up the run, forcing Leidner to try to challenge Mabin and Desmond King with passes. Eleven of the Gophers’ 14 drives lasted four plays or less. Ten consumed 98 seconds or less. The Iowa offense still needs to get better, and it was Saturday in some ways — holding the ball for a season-long 34 minutes, 55 seconds. The offense seems close. Until this week, the defense didn’t. Saturday’s performance offers hope. If Iowa (4-2, 2-1 Big Ten) returns from Purdue next week with a victory, it'll have a fighter’s chance Oct. 22 against No. 13 Wisconsin in a key Big Ten West showdown. Miles Taylor wasn’t requested for postgame interviews Saturday. With three tackles and no gaffes against the Gophers, Taylor wasn't noticed too much. But because guys like he and Mends were noticed Monday through Wednesday, this Hawkeye team took a critical Saturday step.